Learn how to comfort and support yourself. Access your ‘higher self’ and engage with life more deeply, openly and positively. Includes short mindfulness exercises to incorporate into your day-to-day to help you manage stress and feel more at one with yourself. Three insightful, uplifting guided visualizations using mindfulness, beautiful imagery, positive thinking, self-compassion, gratitude, affirmations and relaxation techniques. 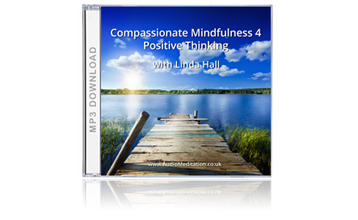 Positive Thinking is the fourth and final in the series – Compassionate Mindfulness: a collection of deeply relaxing meditations combined with simple everyday exercises. Showing how living mindfully and with self-compassion acts as a powerful antidote to modern day stress and supports health and well-being generally. 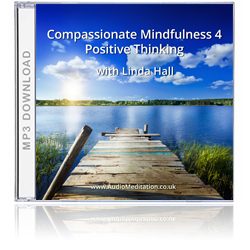 This album focuses on how to engage with your life in positive, insightful ways. Positive Thinking uses the power of metaphor and positive suggestion to induce deep relaxation, increase your sense of wellbeing and access your inner wisdom. The meditation tracks on this album are followed by short tracks suggesting how to easily incorporate what the meditation has taught you into your everyday life. It can be easy to focus on the negative events in life and constantly be hard on ourselves. This disempowers us and undermines our health and well-being – leading to feelings of isolation, depression, and even despair. It’s possible to turn things around for the better through choosing to engage with positive, supportive and empowering ways of seeing things so we can move forward and live with greater fulfilment, joy and peace of mind. We can learn to be happy just as we can learn to be sad, unhappy or angry – it’s an acquired habit.